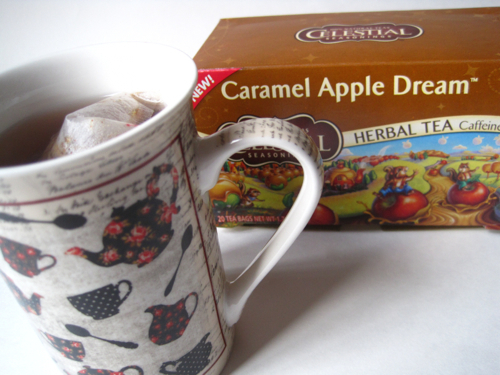 When I was at Whole Foods last week, in addition to the new Cranberry Vanilla Wonderland flavor I also discovered another new Celestial Seasonings tea, this Caramel Apple Dream tea, which I decided to sample using a new mug I got for Christmas. It's funny how my tastebuds want spiced teas in November, peppermint teas in December, but then as January rolls around it's a real free-for-all, a time when anything hot and tasty is perfectly acceptable. When I opened this box of tea, the first thing I noticed was the scent of caramel and spices. When I prepared the tea, however, the dominant flavor was a spiced apple cider, so very sweet that it's hard to believe there's no sugar in this tea! It's a great and guilt-free indulgence for a sugar-lover like myself. 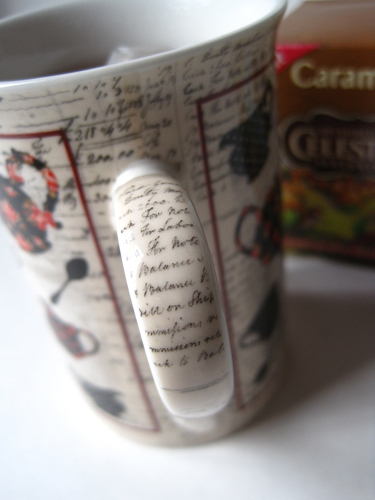 One other fun little note is that my handwriting-and-teawares design mug also has handwriting on the handle, which I had not noticed before but just love! This is definitely going to be my new favorite "workday" mug, as it seems so very appropriate for one who makes her living writing. I hope it will hold many new flavors of tea in the coming year! This year my reading habits changed dramatically. Now that my day job includes reviewing, editing and proofreading non-fiction books as well as novels, a book is what you'll find me reading most of the time, usually at least three or four a week. And because my husband and I also handle the social media accounts for some local businesses, if I'm not reading a book I'm reading one of the many business and technology magazines I now subscribe to, such as Inc., Entrepreneur, Money, Fortune, Fast Company, Wired, etc. 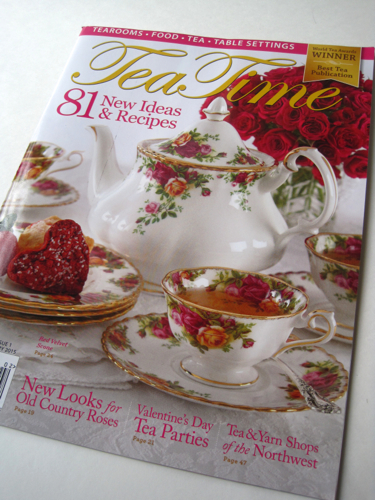 For that reason I let a lot of my general interest magazine subscriptions expire, but one I've kept and that always, always makes me go "Aah" when it arrives in the mail is Tea Time. 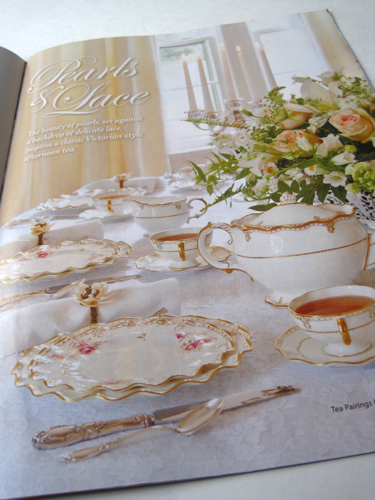 The new issue arrived right around Christmas, and I was so happy to see the beloved Old Country Roses pattern from Royal Albert on the cover. 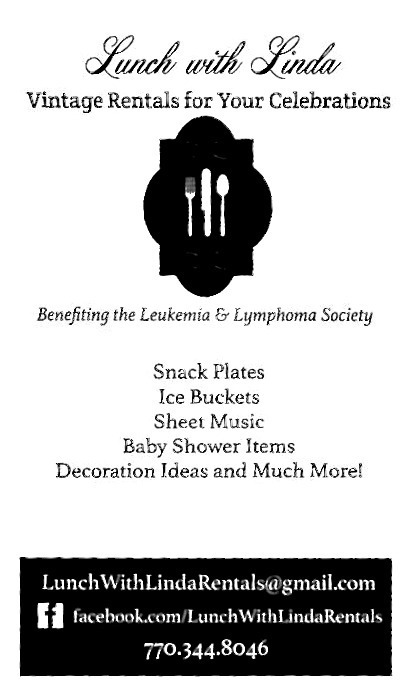 That was my mom's china pattern, of which she had service for 16, I believe, with lots of accessory pieces including various teapots, canisters, flatware and more. I have loved this china pattern ever since I first saw it, but I love it even more for how it reminds me of my mother. 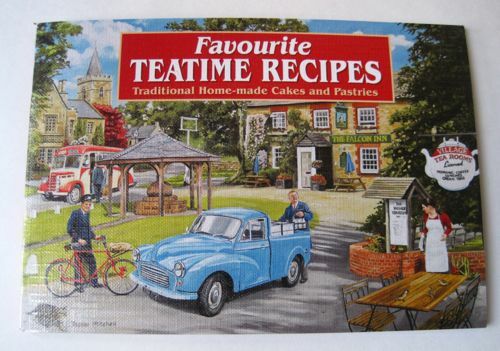 For that reason, I think this is one of the prettiest Tea Time covers ever! Of course Tea Time always gives me something new to lust over, and this time it's this gorgeous Royal Crown Derby Elizabeth Gold china pattern. At $750 for the teapot and $200 per cup and saucer, I'd be scared to touch them, but I'm not at all scared to admire the pretty scalloped shape featured on these pieces. 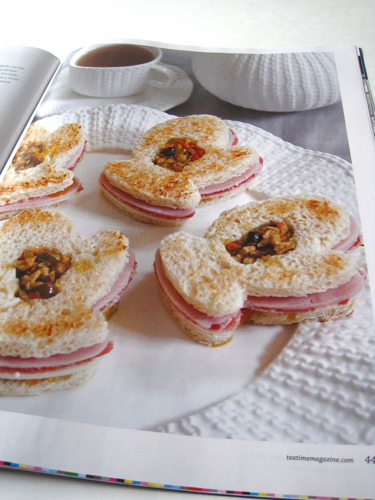 On a more practical note, the recipes this time include one I think is adorable, for these Mitten Muffuletta Tea Sandwiches. The muffuletta is a type of Italian sandwich that originated with the immigrants of New Orleans, and while my New Orleans-born husband insists it's not the real thing unless you have one from, say, Central Grocery in New Orleans, I love the idea of making these cute tea sandwiches sometime in the run-up to Mardi Gras. There's lots to love in this new issue of Tea Time — but especially the cover. Are any of you Old Country Roses fans like myself? Daniele K., so congrats! And thanks to all of you who've entered my giveaways over the past year. 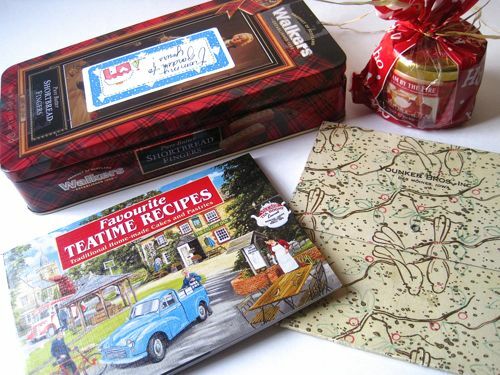 I'm looking forward to finding more tea treats as special giveaways in the year ahead! 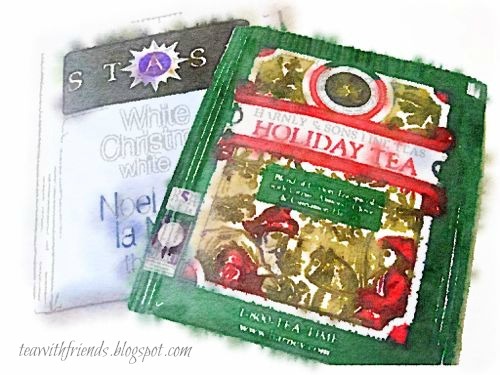 Christmas 2014 saw a few teatime surprises, so I thought I'd share them here and see if you got any tea goodies for Christmas yourself! 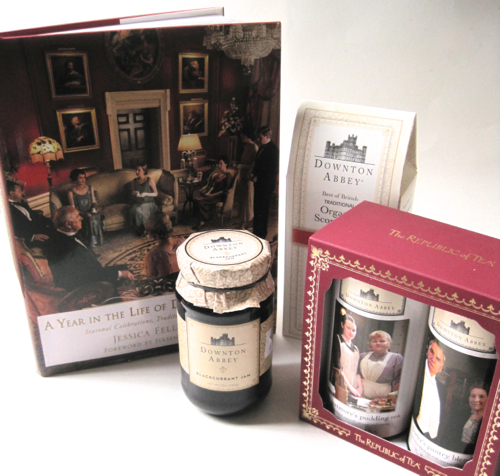 Some of my favorite gifts this year were this new "Downton Abbey" book from my husband (which I am loving reading) as well as "Downton Abbey" teas, scone mix and jam from my stepson's family. I am delighted to have all these great "Downton" treats, especially since the new season (or "series," as they say across the pond) returns on Sunday. Can't wait! 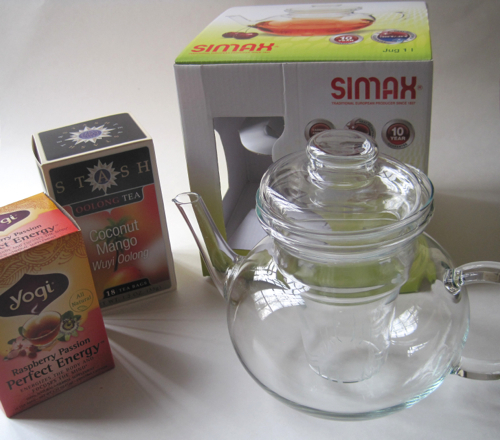 Another lovely surprise came on Christmas Day when my sister and her family surprised me with a new glass teapot and two new teas to try. The glass teapot is a full-size teapot, unlike the one small glass teapot I have. 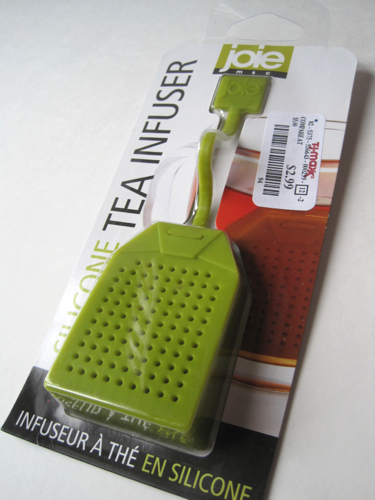 This one has an infuser built in, so I'm looking forward to trying it out! My other tea goodies were "from Daddy," who has taken to simply giving my sister and me the funds so we can go shopping for ourselves and then return with the gifts to be put under his Christmas tree. 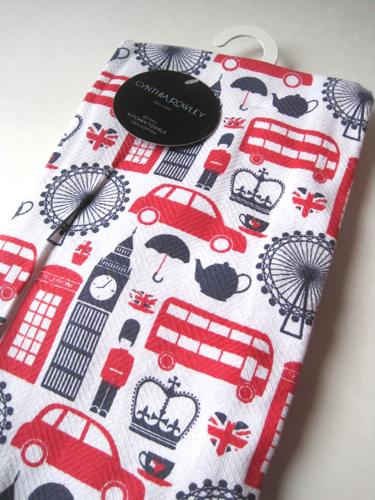 Naturally, I spent part of my gift on some tea things, including this adorable British-themed tea towel I saw at T.J. Maxx. 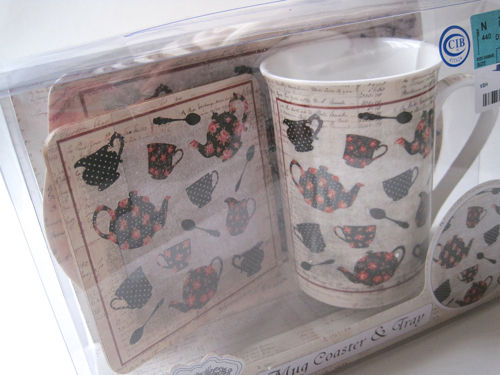 At Ross, I found this cute set containing a china tea mug, coaster and tray. Since I love things with handwriting on them, this was an absolute must! 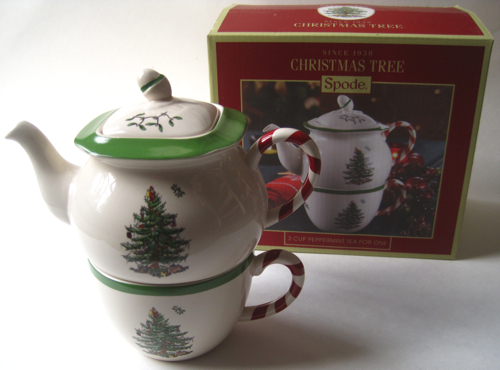 Finally, I got a head start on Christmas 2015 with this Spode Christmas Tree design tea-for-one set from Ross. So now I will be happily sipping new tea in new teawares in the weeks ahead. How about you? 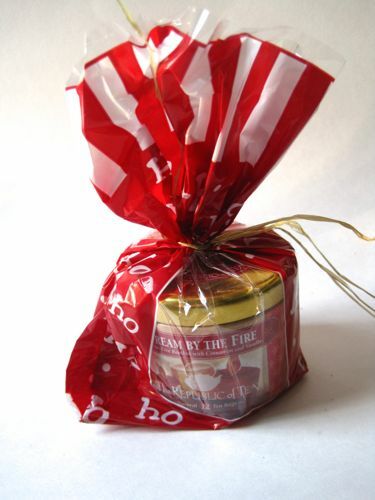 Were any tea gifts under your Christmas tree this year? 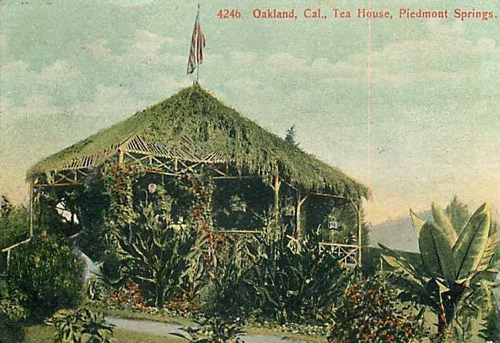 So we end the year of tea room postcards with a very different looking tea room, the Oakland, Calif. Tea House at Piedmont Springs. The date is unreadable, but the card was sent to Capt. 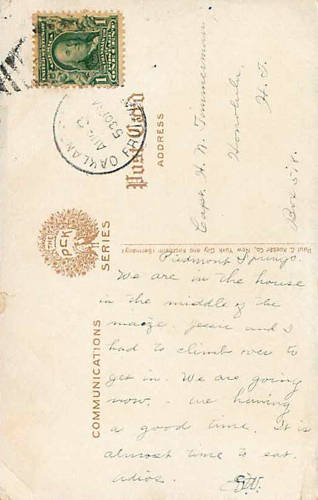 H. N. Timmerman in Honolulu and reads, "Piedmont Springs. We are in the house in the middle of the maze. Jessie and I had to climb over to get in. We are going now. Are having a good time. It is almost time to eat. Adios. S.W. (?)" So was there a corn maze in Oakland way back when? I find this "tea house" most intriguing, and it reminds me of something from "Gilligan's Island." If nothing else, this year of researching tea rooms of yesteryear has taught me that tea rooms come in all shapes, forms and sizes. There were elegant tea rooms in hotels and department stores, tea rooms in repurposed buildings (a hardware store, a grist mill), and finally, a thatched-roof tea room like this one. 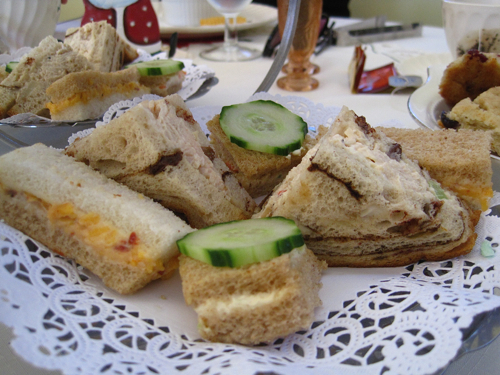 I hope you've enjoyed these nostalgic trips to the tea rooms of the past. Lord willing, I'll be back next Saturday with an all-new Saturday series that's a very different sort of project. Hope to see you then! The bad news is, when my husband and I made our annual pre-Christmas visit to Whole Foods in Atlanta this week, there was no Celestial Seasonings Candy Cane Lane tea. None. Not one box. So I am limited to the single box on hand unless I can find some more on clearance soon. 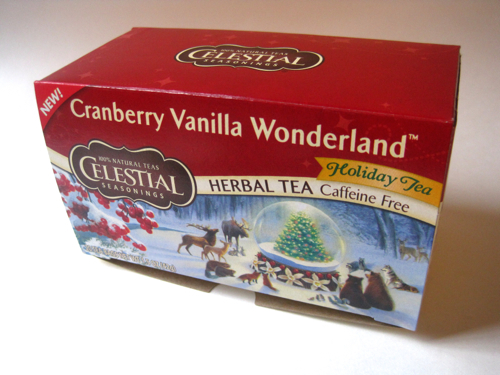 But the good news is, I discovered a most scrumptious NEW "Holiday Tea" blend from Celestial Seasonings, this Cranberry Vanilla Wonderland Tea! And oh my, is this stuff ever good! 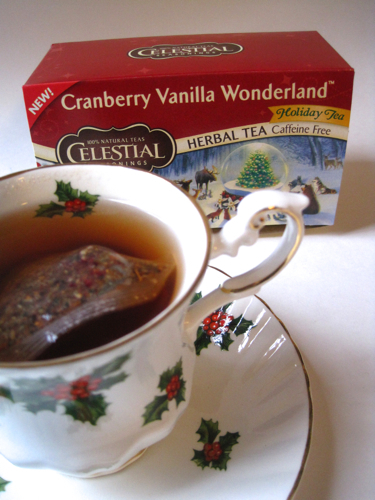 I also brought home a Turtle Brownie from the Whole Foods bakery, and my companion tea was a cup of this cranberry tea. 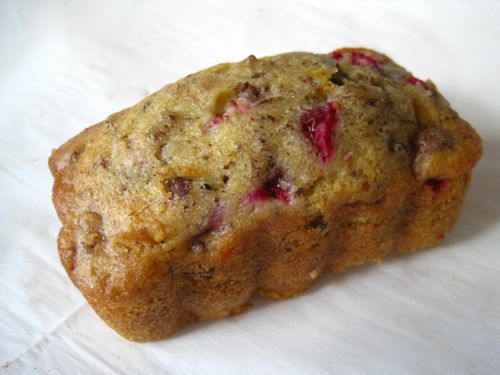 I'm not sure I would have thought of combining cranberry and vanilla, but the combination is so good, so rich, and a perfect balancing act with the fruitiness of the cranberry flavor and the richness of the vanilla. This definitely qualifies as a dessert tea. As I sipped it, it occurred to me that this is *almost* as good as Candy Cane Lane, though I think CCL remains my favorite Christmas blend at this point. Still, how did I not know about this new tea? 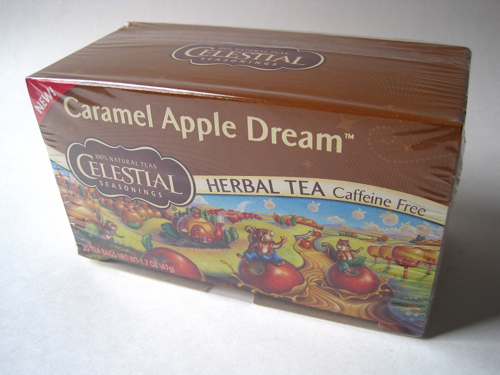 Have any of you tried this new Celestial Seasonings blend? A very special cookbook giveaway! 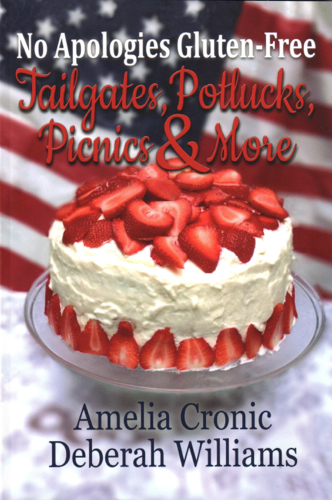 For my final giveaway of the year, I'm happy to be able to offer a copy of my friends Deberah Williams and Amelia Cronic's latest book in their No Apologies Gluten-Free series, "Tailgates, Potlucks, Picnics & More"! I know many of you are eating gluten-free these days, and you can enjoy this cookbook even if, like me, you do not. These two ladies come from a long line of great southern cooks, so their recipes often feature garden-fresh produce and classic southern favorites. I am not, of course, an unbiased reviewer, as I edited this book and am good friends with the authors! These families grill year-round, so those recipes got me hankering to fire up the grill, and of course desserts and side dishes are good at any time of year, no matter the weather. If you'd like to be entered to win this book, just leave an "Enter me" comment between now and 7 a.m. Monday, Dec. 29, and you'll be entered to win. Good luck! 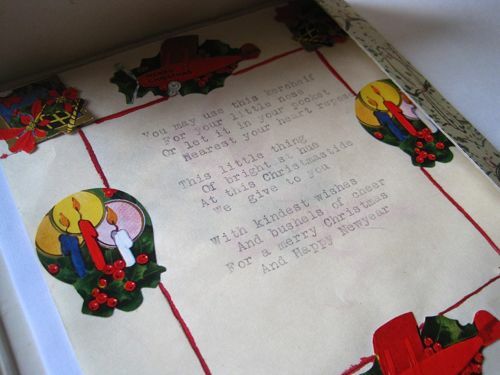 A year or so ago I came across a terrific stash of vintage Christmas paper products on eBay. My plan was to use these as artwork in some sort of Christmas book, but since I haven't gotten around to writing one yet I thought I'd share them anyway! I know many of you, like me, appreciate vintage things as much as (if not more than) you do new things. 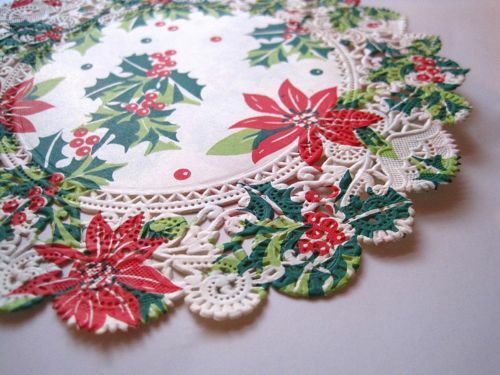 When I see the design of some of these pretty old things, I can't help thinking that maybe, just maybe, the quality was a little nicer back then, as with these festive paper doilies. 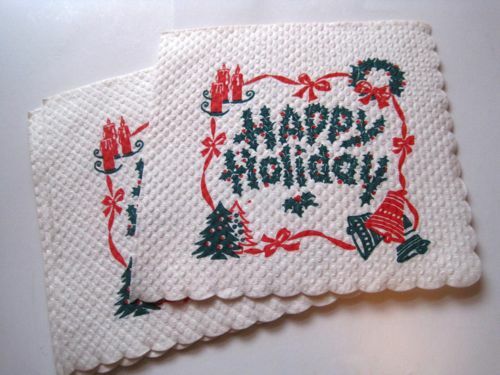 These are cocktail size napkins (the smaller ones), and I love the scalloped edges. These would be a good size to go through the handle of a teacup — if I can make myself actually *use* them one day! 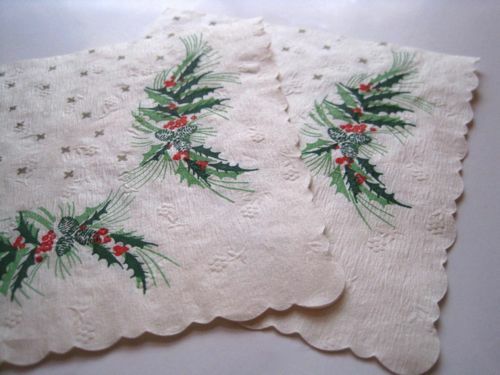 I like the pinecones on these napkins, and if you look closely, you can see a little flower design embossed into the napkin. Nice touch! 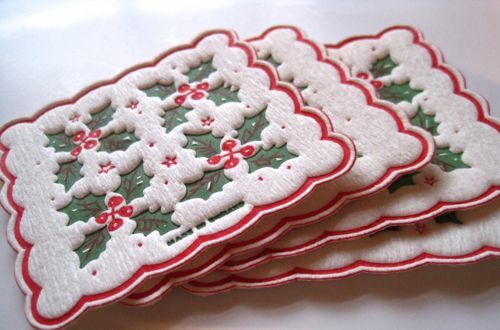 These were probably designed to be throwaway coasters, but they're padded, and quite lovely! I'm saving these for a future Christmas tea to use with the water glasses. The editor in me wants to put an "s" at the end of the word "Holiday," although I suppose it's accurate to wish someone a "Happy Holiday" since here that obviously means the Christmas holiday. 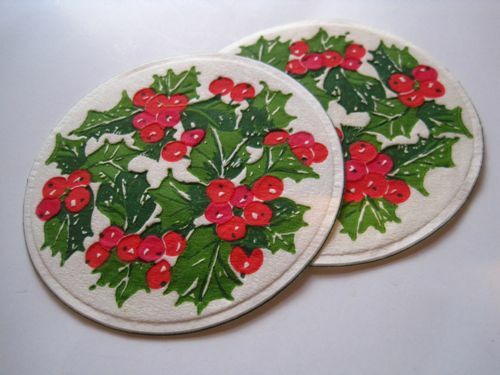 Here are more padded coasters, these stamped "Made in England." Love these! 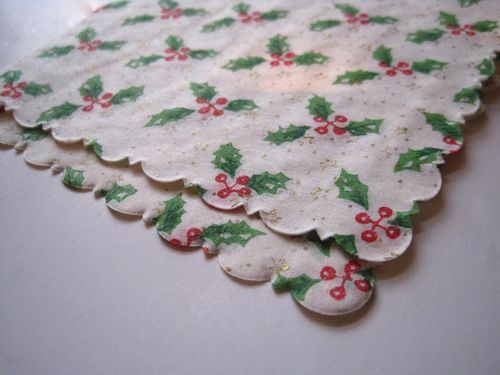 And we end with more scalloped napkins, this time with a touch of gold metallic accents. My question is: Who thought to save these lovely old things that were never designed to last? At any rate, I'm glad they did! Christmas playtime and the Waterlogue app! Oh, have I ever been looking forward to this week! Not only is it Christmas week, but also it's a week of some much-needed downtime. Over the weekend, I celebrated by finally purchasing the Waterlogue app that my friend Judith wrote about on her blog earlier this year. When I searched her blog to see when she first wrote about it, I was astonished that she first mentioned this way back in the spring! This wonderful app turns your photos into artwork, and I am astonished at how beautiful the results are. I really feel as if I've just been given the greatest new toy, and the iPad app was only $2.99. As I told my husband, I had $2.99 worth of fun within the first hour of using it! Just to give you an idea of how simple this is, click here to see this original photo. All I did was open it in the Waterlogue app, and I played around with the various styles and chose "Illustration" for this one. Finally, I thought I'd take a photo of two Christmas teabags and see how they would look. I received both of these samples from tea friends, the White Christmas Tea from Stash Tea from Margaret, the Harney and Sons Holiday Tea from Michele. Using the "Color Bloom" style, this is how it turned out, and I just love it. So as you can tell I've got a little more free time on my hands this week. I plan to catch up on blogs, play with my new app, read and … take a nap! What does your week have in store? 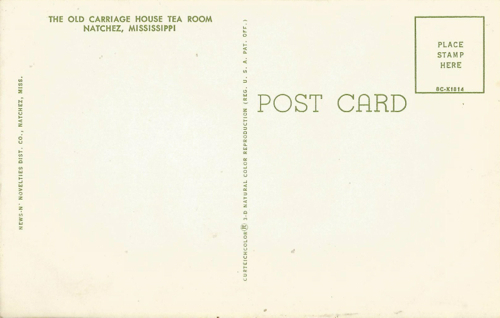 I thought it was probably too much to hope I could find a tea room postcard showing some Christmas decorations, but I think I've come close. Check out the colorful strand of Christmas lights hanging from the tree in front of the Old Carriage House Tea Room in Natchez, Mississippi. Does that count? I hope so! This card was postally unused, but the price was right so I got it anyway. And I was glad I did, because I learned that, happily, this place is still in business. 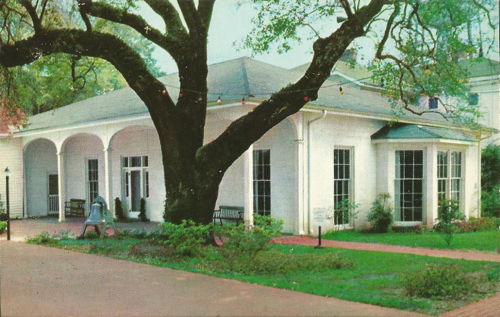 According to their website, "Long famous for its Southern cuisine, The Carriage House Restaurant has been the site of many memorable weddings, rehearsal dinners, receptions, and parties since 1946. In days past, folks clamored for the fried chicken and buttery silver dollar-sized biscuits. 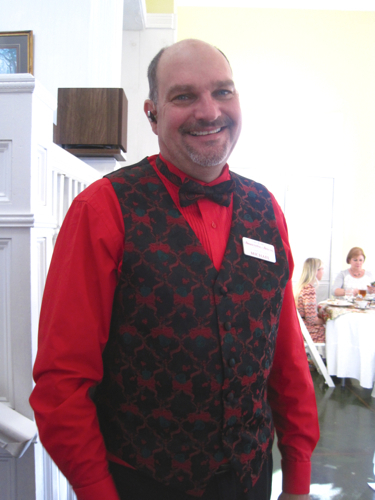 Fried chicken and biscuits are still favorites at The Carriage House, but thanks to Chef Bingo Starr, our menu is delightfully varied. The Carriage House offers a Blue Plate Special Wednesday through Friday. The specials themselves vary from month to month and include soup, salad, and sandwich specials, Southern comfort food, and fresh Gulf seafood." Now first, do you not LOVE the chef's name, Bingo Starr? But I also love knowing this former tea room is still serving customers. Go here if you want to see what it looks like today! 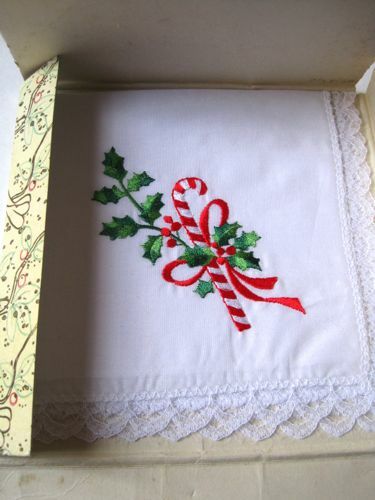 Years ago I read a quilting magazine with a column by someone who called herself "The Goddess of the Last Minute." As a last-minute kind of girl myself, I could appreciate that sentiment. One day this week, I set aside a few hours to bake Christmas treats for some business clients. I was going to use some rectangular mini loaf pans, but at the last minute I discovered that I do not in fact own any mini loaf pans. 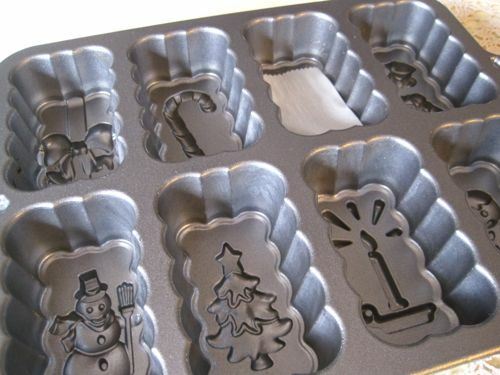 I thought I did, but what I had was mini loaf pans shaped like Christmas trees, which is not what I had in mind. Then I remembered finding this Nordic Ware Christmas pan on clearance earlier this year. It would have to do. I had loaves of Cranberry Tea Bread to bake! The mini loaves came out beautifully, but they sort of wobbled on the bottom because of that raised design featuring a bow, snowman, Santa, candy cane, etc. "If only I could cover up that indention," I thought, and then I realized I could! I simply snipped off pieces of parchment paper, plopped them into the pan as shown here, and voila, flat-bottomed mini loaves could be made in this pan. I was so proud of my solution to this latest baking blunder, I thought it was worth sharing here! It has been a fun week of opening the mail at my house. First I got an unexpected vintage teacup in the mail, and then I received the package containing the "little something" that my fellow tea blogger Bernideen had said she was going to send me. It included all of these great goodies. Want to see what's inside a few of them? 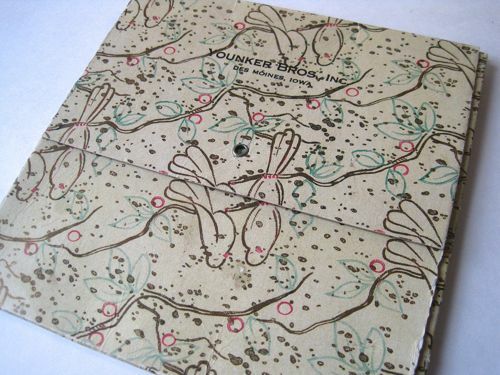 My favorite item, by far, was in this flat box from Younker Bros., Inc., a famous department store in Des Moines, Iowa. Bernideen knows my love for department store history (especially department store tea rooms), and in fact she has shared with me before that she went to Bible College in Des Moines and on two occasions attended events held in the Younkers Tea Room. The box was very lightweight and about the size of an old 45 record. One of my favorite features in all of the blogosphere each spring is Bernideen's popular "tea in the garden" series, and in this tin she packed some dried goodies that actually came from her garden! Oh, how I wish I could click "insert scent" and let it waft its way to you over the Internet. 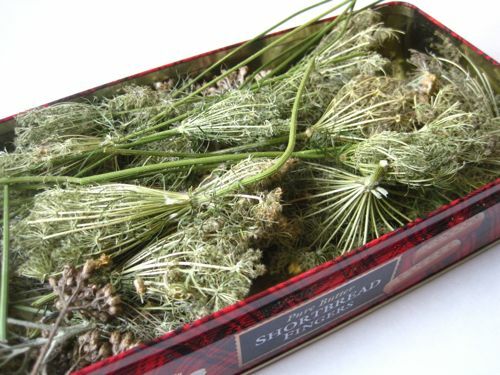 Instead, you'll just have to trust me when I say the lovely, lemony scent of dried botanicals is so addictive I keep lifting the lid on the tin just to take a whiff whenever I walk by. I may display these in a pretty dish after Christmas, once the scents of cinnamon and apple cider candles have departed! I'll bet many of you have seen these cute little teatime recipe books before, and this is one I've never seen before, so I am extra happy to have it! With lots of recipes for cakes, gingerbread, tea loafs and more, I'm sure I'll be baking something out of this very soon. And last but not least, there was a tin of Republic of Tea's Dream by the Fire tea, a wonderful rooibos blend with cinnamon and vanilla (which I am sipping as I blog). 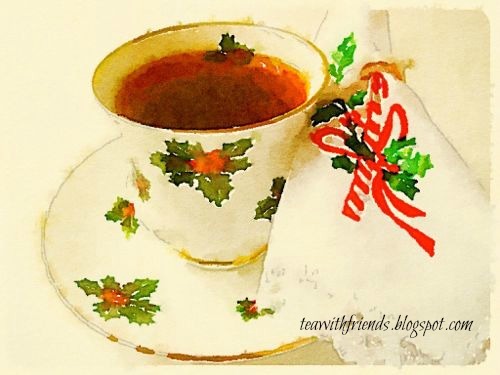 Christmas is still a week away, but I must say I've already had a very, very good one, especially with some unexpected gifts from tea blogger friends this week! 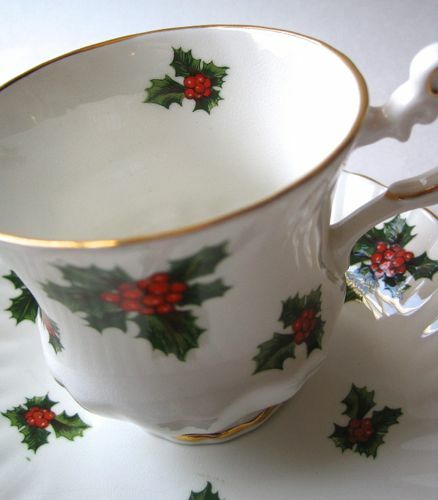 A new Christmas teacup to love! The first surprise on Monday night was that the mailman came at all. I'd given up on mail delivery for the day when the mail still hadn't arrived at 7 p.m., so I went upstairs to do some writing. 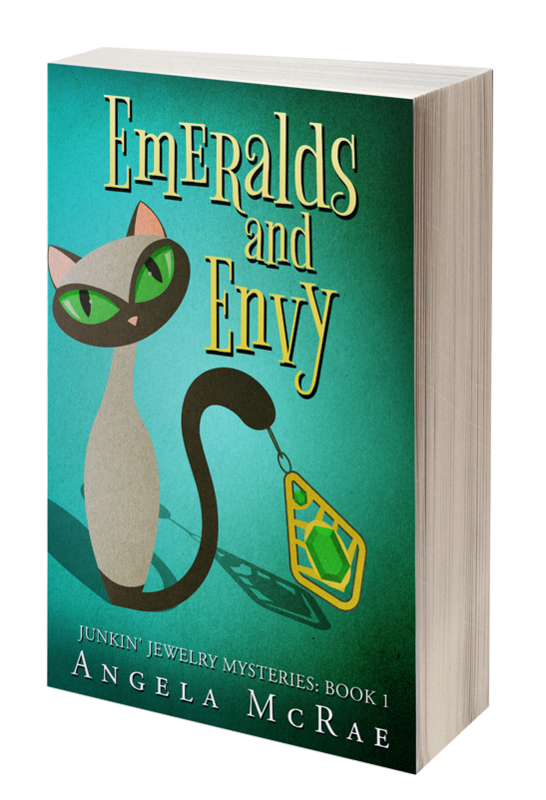 When the doorbell rang about 8 p.m., I heard the familiar revving of the postal truck backing out of the driveway. Good. I had ordered one of my nieces a piece of jewelry for Christmas, and it was a day late arriving but surely this was that package. To my delight, not only was her gift there, but there were also two gifts just for me. The first one I opened contained this Royal Dover teacup from my tea blogger friend Michele at Finch Rest! Isn't it lovely? I think it is just beautiful! 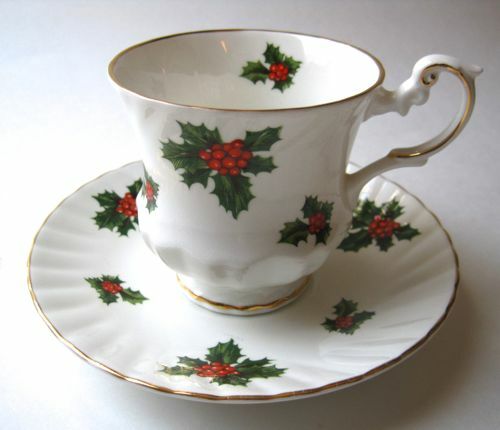 The holly and berry design is one of my favorite Christmas motifs (and the cup even has a sprig of holly inside! 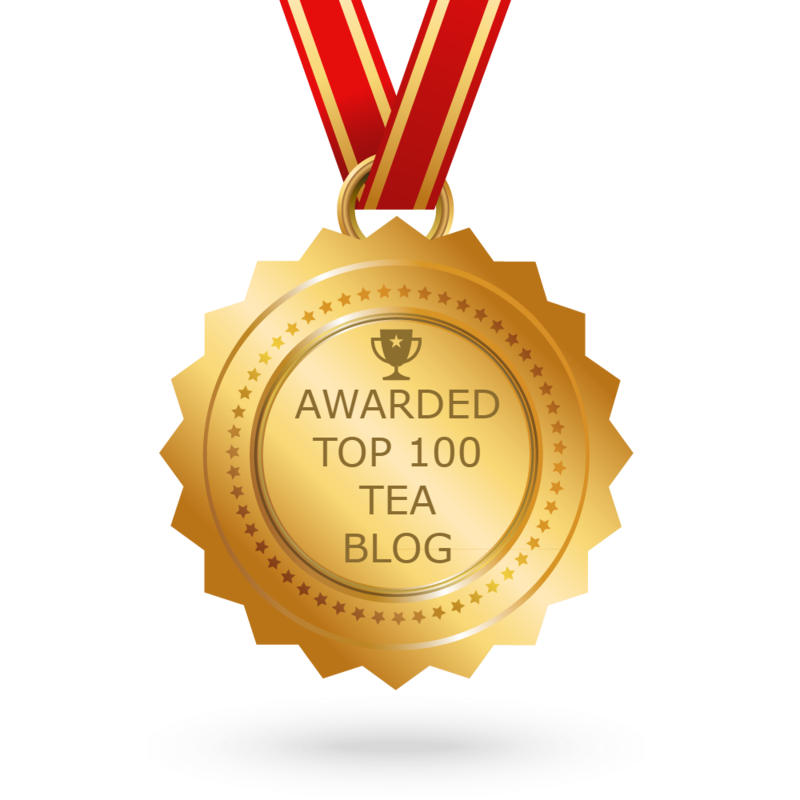 ), and of course it means the world to me that a fellow tea blogger gave it to me. 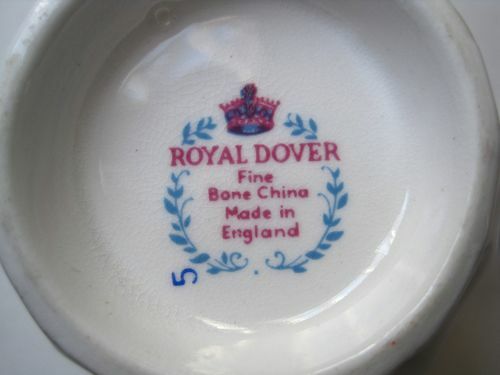 The word "Dover" also pleases me for reasons that have nothing to do with china! In 1964, the year I was born, the Best Picture winner was "My Fair Lady" starring Audrey Hepburn. (Audrey and I share a birthday, May 4.) There's a famous scene in "My Fair Lady" in which the up-and-coming Eliza Doolittle goes to the races and bets on a horse named Dover. In the sort of social faux pas I would no doubt commit, she begins to yell, in a most unladylike fashion, "Come on. Come on, Dover. Come on. Come on, Dover, move your bloomin' ... (unladylike word for "hinder part")." For that reason, the word "Dover" often makes me smile. Seeing it on such a ladylike Christmas teacup will, I hope, help me remember to always act like a lady! 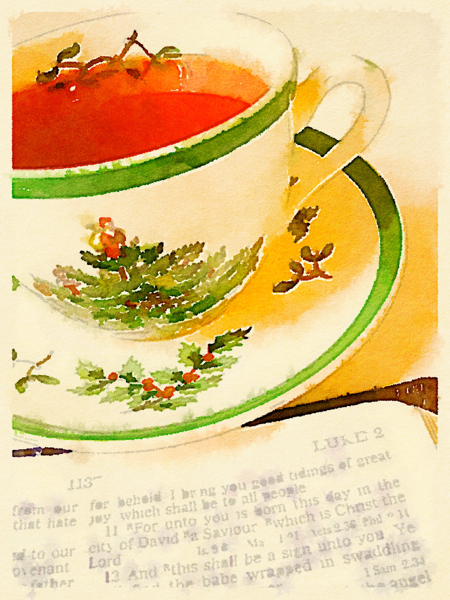 Tea-themed Christmas books — and a fantasy one! Because there aren't that many tea-themed Christmas books out there, I've made a custom of looking through the same ones year after year. The ones I currently own are, clockwise from left, "The Twelve Teas of Christmas" by Emilie Barnes, "Christmas Teas of Comfort and Joy" by Emilie Barnes (text is from the earlier book, but the artwork is different), "A Cup of Christmas Tea" by Tom Hegg and "A Christmas Wish" by Dee Appel. 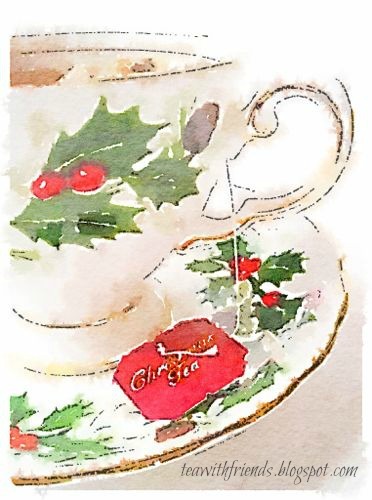 I have to tell you that I have a *great* idea for a tea-themed Christmas book, but I don't want to be the one to write or edit it, so feel free to take my idea and run with it. 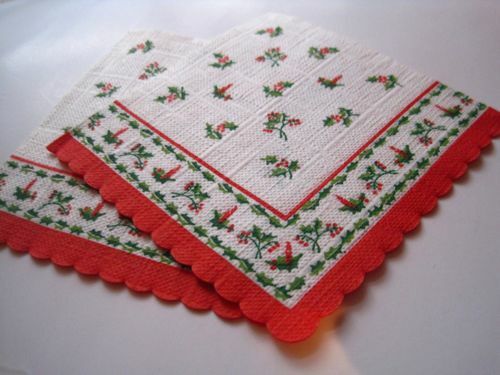 I'd love to see a great big, beautiful, glossy hardback book featuring stories and photos of those Christmas tea table settings we've all enjoyed for so many years. 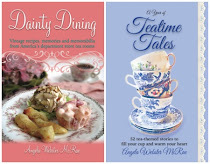 Wouldn't that be neat, to have a gorgeous book with, oh, a hundred or more table settings from church and charity Christmas teas, and the story of how someone used Aunt Nellie's china pattern or Grandmother Louise's silverware? It would have to be a big-budget project to support quality photography (and the travel budget to fly someone to so many teas), but I think women across America would want a copy. 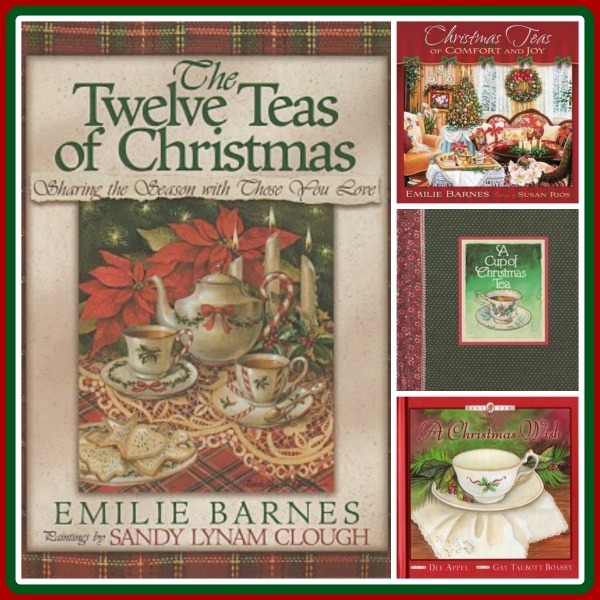 Meanwhile, do you have any other tea-themed Christmas books I should add to my list? 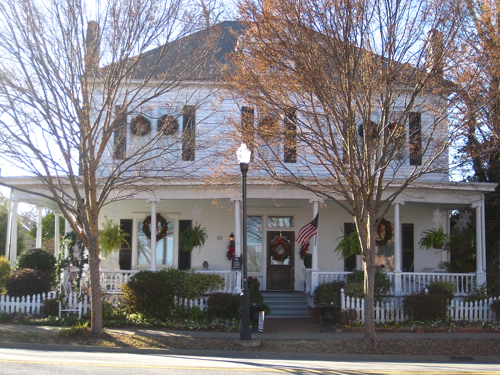 On Saturday, I had the wonderful opportunity of attending a Holiday Tea at one of Newnan's finest old antebellum homes, the Banks-St. John-Meyer house, known around here as the special events facility Something Special. At the tea are, from left, Joanie, Cynda, Robin and me. I've known Joanie for years, and she is such a joy to be around. I don't believe I've ever heard a negative word come out of her mouth (what must that be like? ), and this was the second time she and I have enjoyed tea together at Something Special. Cynda is another tea-loving friend I got to know through this blog and then discovered we were going to the same church, so we cross paths a lot of places. Cynda's friend Robin is a well-known pianist in this area, and though I've had the pleasure of enjoying her music many times before, I'd never had a personal conversation with her and found her just delightful. 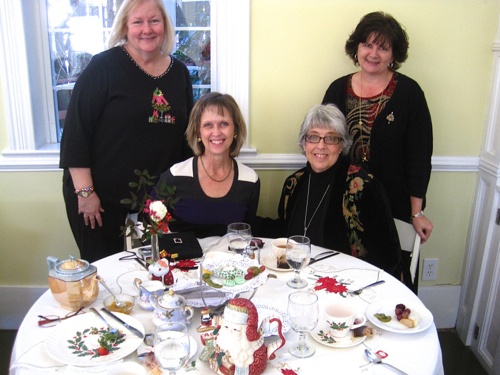 It was so lovely to get to enjoy a Christmas tea with these ladies! 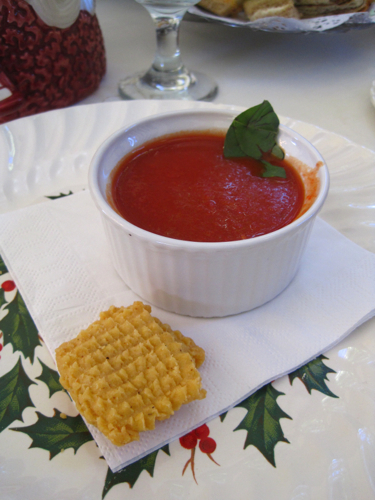 As soon as we were seated we were served Tomato and Roasted Red Pepper Soup and Cheese Straws. What a wonderful, fresh-tasting soup this was, and of course we all agreed we absolutely love cheese straws in any shape, form or fashion. The cheese straws I make are never this fancy, so I appreciated the prettiness of these! Our horizontal tiered server was one of those old-fashioned ones that has one tier up top and one on either side. 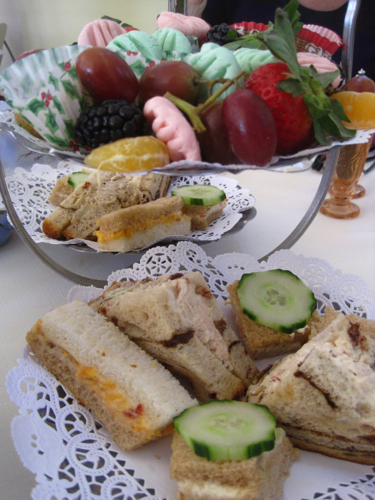 It was filled with delicious sandwiches and sweets! 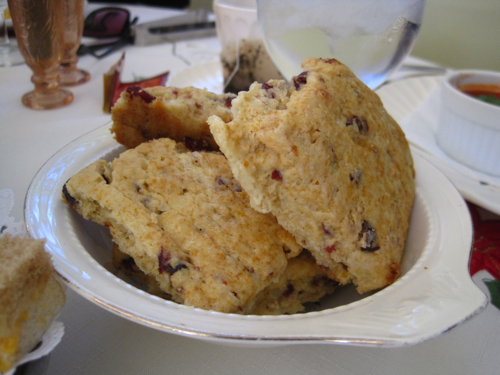 The Cranberry Scones were fresh and hot, and though I failed to get a picture of the orange marmalade that was served with them, I must say that the combination was great! I was surprised by how many varieties of fruit were on the tray: grapes, strawberries, blackberries, oranges, kiwi (not showing, but they were there). 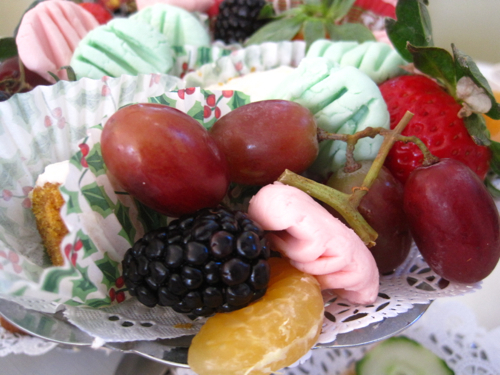 And oh, those pastel cream cheese mints (I believe that's what they were) were melt-in-your-mouth good. I haven't had those in years, and they were such a welcome treat. I didn't get a good closeup of the iced carrot cake (in the decorative paper cups), but it was a hit as well. As is often the case at afternoon tea, I felt myself getting full way too soon! 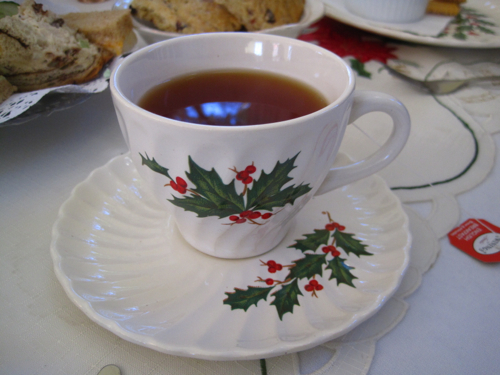 I loved that our plates and cups and saucers were all Christmas designs. We all had pots of hot water and got to select our tea bags from a variety of flavors in baskets that were passed around. I selected Twinings English Breakfast tea to begin with, then later switched to a berry-flavored Stash tea. There were plenty of varieties to make everyone happy. Tea was served in several areas of the house, but this is the large room where my friends and I enjoyed tea. Our table was the round one at lower right. The photo of me and my friends, by the way, was graciously taken by the owner himself, Mike Meyer. Mike is a class act if ever there was one, and I'm so happy to have gotten to know him over the years. On Saturday, he showed me he still has hanging in his library a copy of a newspaper article I wrote about him and Something Special way back in 2001. Imagine! 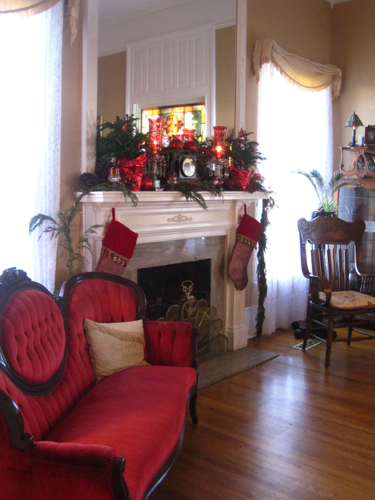 The whole house was beautifully decorated for Christmas. For sheer holiday beauty, I think it's rather hard to top a red velvet sofa and a gracious mantel in an old antebellum home! 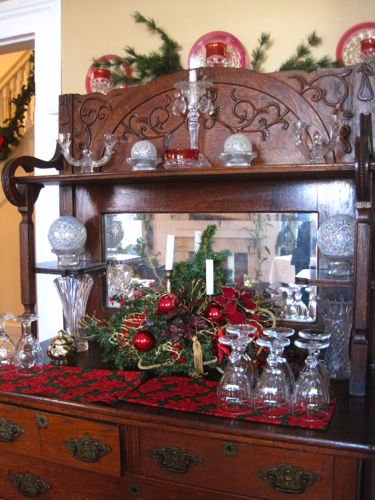 And this sideboard and other pieces of furniture displayed some of the many glasses used for serving. But check out the cranberry glass up top, which actually lined several walls in one room. 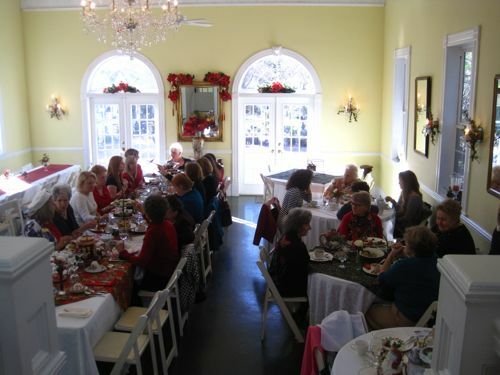 It's a treat to get to enjoy a delicious holiday tea with friends, and it is definitely "Something Special" to get to do so in such elegant surroundings! "A request from the Palace ..."
Time for the tea-themed Christmas tree!